In case you don’t already know, NaNoWriMo is the moniker for National Novel Writing Month. 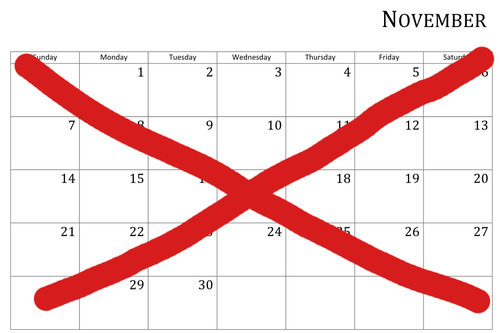 It takes place every November and challenges writers to complete 50,000 words of a new novel during the month November. Every year, as November rolls around and I hear my writing friends gear up for it, I grow irritated. Why, I think, wait until November to write? If writing is a passion, if this is something you really want to do, why not just write! There is a fallacy that in order to write a novel you need long, contiguous stretches of time devoted to the muse in order to complete a book-length project. People dream of renting a cabin in the woods or a farm house in Italy so they might sit behind a desk, uninterrupted for days at a time, writing. But that’s not the way to pile on the pages. I discovered this the hard way early on in my writing career. At the time I was working as a consultant with a flexible schedule. Under the contract, instead of working eight hours a day, I had the option of working nine hours, thereby getting a day off every two weeks. Perfect, I thought. I’ll have an entire day every two weeks to write uninterrupted for an entire day! Instead of rolling into work at eight o’clock each morning, I’d roll in at seven, work an extra hour each day, and have my glorious writing day off. However, what I discovered is that it is very difficult to be productive every moment for an entire day. There were meals to eat, bathroom and stretch breaks to have, and occasional errands to run. Oh, I’d manage to write ten to twelve decent quality pages, but it wasn’t much output after two weeks of waiting. Then an idea occurred to me. What if I returned to my old work schedule, without the day off? But what if I still came in to work an hour early each morning, however instead of working that first hour I’d spend it writing. Usually, no one was at the office that early anyway, so I could write one hour every day uninterrupted. What I discovered is, when you write every day, especially the same time every day, you can really build momentum. It’s like having a daily appointment with your muse. Not only was I writing two and often three pages every day, it was good quality stuff. Suddenly my writing took off. It was as if I wasn’t so much writing as I was transcribing an inner voice. Often I couldn’t type fast enough to capture everything that was coming in and the creative ideas and plot twists that I was coming up with were way better than what I’d originally outlined. Now, at the end of two weeks, instead of having ten to twelve pages to show for it, I’d have twenty to thirty pages, and the writing was way better than it had been on those full days off! NaNoWriMo is a crutch. Ignore it. Do you want to write? Then write! Usually, all NaNoWriMo will get you in the end are pages of writing hacked and slashed onto the page, low-quality writing that will require months and months of edits and rewrites before they are in a state to show another human being. What’s stopping you from going to work one hour early, finding some quiet spot, and writing?